KILLINGTON — Over 400 people participated in the National Ski Areas Association (NSAA) Eastern Winter Conference and Trade Show hosted by Killington Resort last week. The annual NSAA conference featured sessions on topics of interest to the ski industry, from the best practices for terrain parks or rental shops to how to plan for a mountain coaster or reach more guests online through the latest web trends. A number of current issues were also addressed, from cyber security to website accessibility to the need to bring more first-timers into snow sports and help them become lifelong participants. The latter has been one of the most significant challenges confronting the ski industry in recent years because the ‘baby-boomers” — a cohort of skiers born between 1946 and 1964 who drove the industry’s growth in the 1950s and 1960s — are now dropping out at increasing rates. “Without an industry-wide effort focused on attracting newer, younger participants and converting them into loyal skiers and riders, ski areas could face dramatic declines in visitation in the not-so distant future … The industry can accomplish the overall turnaround that is needed by improving the conversion rate to 25 percent,” warned NSAA President Michael Berry in 2010. NSAA then launched its Conversion Cup Challenge as part of its updated Model for Growth to increase snow-sports participation by piquing competition among member areas and to recognize those who make significant strides in boosting conversion rates. Killington Resort won the 2015 Conversion Cup Challenge Award in recognition of its industry-leading conversion results, innovative instruction programs, and dedication to tracking first-timers and encouraging repeat visits. One of the challenges of attracting first-timers into snow sports is dealing with all the cool images and videos of powder shots and big air that one finds on websites and in the media. Acknowledging that they might be great to tell the experienced skier or rider how steep or cool an area is, the session on Conversion Best Practices focused on reaching out to attract new skiers and riders with more basic messages. The presenters explained how their use of videos, websites, social media, email and direct mail as well as special beginner programs are designed to communicate the right message in the right way to attract new people. Rob Megnin, Killington’s director of sales, marketing, and reservations, shared the elements of the resort’s efforts that led to an increase over its previous 35 percent conversion rate to 50 percent for 2015 (first-timers who returned three times). Megnin shared strategies, including a video of the first person to graduate from the Discovery programs, which Killington pioneered three seasons ago in partnership with Elan and which now also includes Burton snowboards; a TBL™ (Terrain Based Learning) article in Killington’s 4,241 Magazine; Bring-a Friend participation; and follow-up emails along with other return incentives — “messaging that attracts them and keeps them coming back,” he said. TBL™ offers a program of getting never-evers into riding or skiing by using specially shaped terrain to hasten learning and lessen fear by controlling speed and was developed by Snow Operating. Killington’s ¾ mile TBL trail is used for lessons and by the general public. This was not the first time Killington shared its game-changing strategies, as Megnin is a firm believer in the need of the ski industry “to do a better job” of bringing more skiers and snowboarders into snow sports. More than ten resorts have adopted Killington’s innovative Discovery programs which reward first-timers with free equipment. Michael van Eyck noted that Bromley does more internal marketing to acquire first-timers, focusing on its Kids Rule (free equipment package), Super Duper 6-Pack, and sharing of ideas and dollars on what works with sister resorts Jiminy Peak and Cranmore. Carolyn Stimpson discussed the use of illustrated signage which shows first-timers steps in the process from arrival to the slopes, a method that emphasizes simplicity and does away with any language barrier, as Wachusett has a diverse Boston market that includes those who don’t speak English. 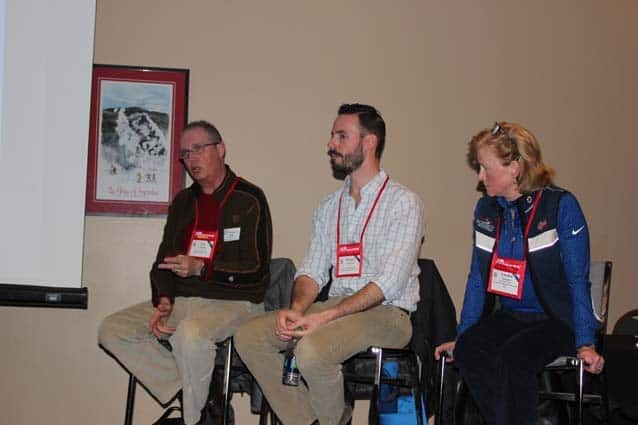 Also sharing strategies to improve the learner experience was Killington’s Snow Sports School Learn-to Ski & Ride Coordinator Ray Allard, who served on the panel addressing best practices for rental shop set-ups. In discussing the latest results of NSAA’s beginner conversion study, Rob Linde of RRC Associates, which analyzes ski industry data, noted some hopeful findings among preliminary 2015-16 survey results regarding questions on first-timer aspirations. On a 1 to 10 scale, the average score for “How much fun did you have on recent visits to this resort” was 8.5. For “How likely to ski/snowboard additional times” this season, 8.2, next season, 8.9. To the “Likelihood of skiing/snowboarding becoming a lifelong activity,” 8.3. Linde commented that resources, time, and dollars spent on such improvements as magic carpets, rental shops, lessons, TBL, grooming, etcetera are creating a better experience for learners and that the industry is doing a good job. However, he added that years of follow-up data are needed to see if “life gets in the way” to growing participation and encouraged more ski area participation in the study, noting participants get a dashboard that will help them understand the likelihood of first-timers continuing among other findings. NSAA is a trade association representing 313 alpine resorts that account for over 90 percent of the skier/snowboarder visits nationwide. Additionally, it has 414 supplier members who provide equipment, goods and services to the mountain resort industry.